THE Ramu nickel mine project may be further slowed down due to a new twist of events in the few days before Christmas. Jailed chairman of the Kurumbukari Landowners Association, David Tigavu and his successor, Eddie Itarai, who was voted in last Thursday, have decided that two major issues surrounding KBK landowners would be temporary halted. One of them is the relocation exercise for landowners of the Kurumbukari mine site to their newly constructed homes. The 30 houses, since their completion nearly one and a half years ago, have not yet been occupied. A relocation exercise scheduled before Christmas had to be postponed till sometime next year. This would mean settlers currently in the Special Mining Lease (SML) 8, Palai area, would remain there while any further works by the company would be halted. Itarai also stressed that the memorandum of agreement review, which is outstanding, would be halted until Tigavu had completed his term. Tigavu was sentenced to 12 months imprisonment on the 17th on three counts of contempt charges laid against him in October. The incident which sparked the contempt proceedings happened on Sept 23 where lawyers and plaintiffs fighting over the deep sea tailings placement (DSTP) dumping at Basamuk in Rai Coast. Tigavu threatened and incited physical violence against and between parties to ongoing court proceedings, threatened and abused lawyers who were involved in those court proceedings and threatened and abused persons who were witness in those court proceedings. David Tigavu, Chairman of the Kurumbukari Landowner Association, and one of the most vocal supporters of the Ramu nickel mine in Madang, has been sentenced to 12 months jail after being convicted on three counts of contempt of court. Tigavu was found guilty of threatening and inciting violence against parties to on-going court proceedings; threatening and abusing lawyers involved in the proceedings; and, threatening and abusing persons who may be witnesses. Tigavu’s jailing could have a major impact on the commissioning of the Ramu nickel mine as he is the leading figure among the clans from the mine site. The mining company, Ramu NiCo and two of its employees are also facing contempt charges over threats to the plaintiff’s. Their case will be heard in February. MP Sam Basil has criticized the Department of Conservation (DEC) for failing to regulate the mining industry in Papua New Guinea and ensure mine operations are environmentally safe. “DEC has a responsibility on behalf of the Nation to ensure mining operations are safe and will not damage the environment. Yet time after time the mines end up causing massive problems while DEC sits by and watches”. “It is not good enough for Minister Benny Allen to say DEC received an environmental audit report on the Hidden Valley mine in May this year and will be working on an environmental improvement plan”. “If the Minister’s sponsored report audit says the river is safe then I will invite the minister to Watut River to consume a litre of Watut River to prove to me that the rivers is safe”. David Tigavu, Chairman of the Kurumbukari Landowner Association, and one of the main supporters of the Ramu nickel mine in Madang, has been convicted by the National court on three counts of contempt. The charges related to threats and incitement to violence by Tigavu outside the Madang courthouse against the landowner plaintiffs and their lawyers in the on-going dispute over the Ramu mine’s marine waste dumping plans. Tigavu was found not-guilty on a fourth charge of questioning the integrity and impartiality of the judge, although it was found he had described the judge as sympathetic to the plaintiffs which was not complimentary and had negative connotations. The judge found Tigavu behaved in an angry and aggressive manner and threatened and incited physical violence which was likely to interfere with the administration of justice and had a real potential to stop parties, lawyers and witnesses putting their case and giving evidence freely. Tigavu is from the area of the mine site, 135km away from the coast where the mine waste will be dumped into the sea. In his evidence to the court Tigavu admitted that his clan, being from the mine site, has nothing to do with the marine waste dumping issue, which he described as a coastal matter, or with the legal case. Tigavu also said his people displaced by the mine construction have been living in makeshift shelters and feeding on rice and tinned fish for two years while they wait for proper relocation. He said people have no proper source of clean water and are getting sick as a result. He also said a health centre and school have not yet been built and the road network to the villages is only half complete. Tigavu claimed these hardships were being caused by the legal challenge by the coastal people to the marine dumping plans. Member of Parliament, Sam Basil, says a statement issued by the Hidden Valley mine on 16 December, claiming he has withdrawn legal proceedings over the pollution of the Watut river is untrue. “I have not withdrawn the legal proceedings on behalf of 110 landowners who have been seriously impacted by the pollution of the Watut river by sediment and heavy metals from the Hidden Valley mine”. “For the Hidden Valley mine to claim that I had made an announcement to that effect is incorrect”. Mr Basil says he has been in dialogue with the mining company, Morobe Mining Joint Venture (MMJV) and representatives of its owners, Harmony Gold and Newcrest Mining, in an attempt to find a satisfactory resolution of the issues without having to go through lengthy and expensive court proceedings. “To that end I have agreed not to take any further steps with the litigation until my lawyers and scientists meet with the mine owners in January. But I have not, and I repeat have not, withdrawn the proceedings”. “I am also very disappointed that MMJV have not issued a further media release, as requested by my lawyers, correcting the public record”. Hidden Valley mine General Manager, David Wissink, has gone on the record with the almost Orwellian claim that his mine “places a high value on responsible environmental stewardship”. If your mine and its owners, Newcrest and Harmony Gold, place a high value on responsible environmental stewardship why is the Watut river suffering from sedimentation and toxic pollution problems? Did you ensure the construction of stable waste dumps using fresh rock during the mine construction as promised in your Environmental Plan? When you had to remove higher levels of overburden than had been expected did you ensure it was properly and safely stored before carrying on? Is it true you failed to construct the two retaining dams promised in your Environmental Plan to stop runoff into the river system? Come on Mr Wissink, haven’t the landowners got it right when they say “your attitude was to get into production as soon as possible to contain costs rather than remedying the dumping and erosion problems”? No-one, just no-one, is going to be fooled by fancy rhetoric, Mr Wissink, while the evidence is clear that the mine has caused serious environmental problems. There was an embarrassingly low turnout for the Department of Conservation’s expensive Public Forum on marine dumping of mine waste in Madang on Wednesday. 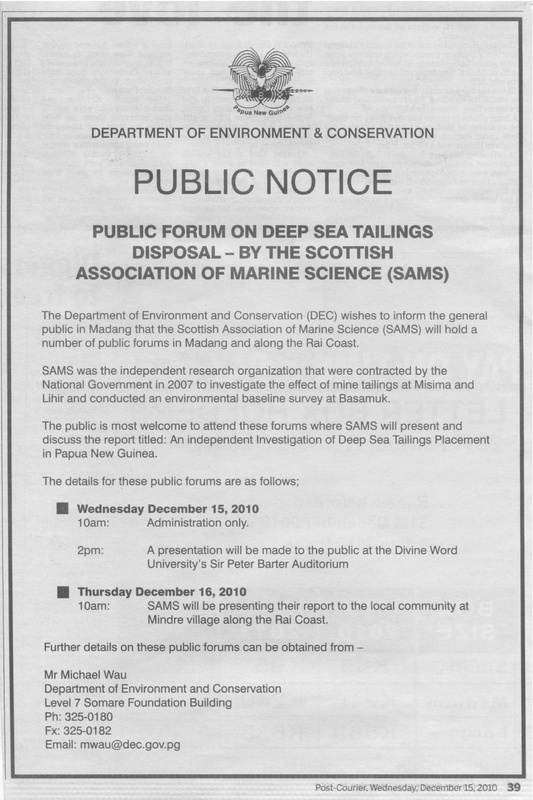 Only 9 members of the public were present to hear a presentation from the Scottish Association of Marine Scientists who were commissioned in 2007 to do a study on marine waste dumping in PNG. The public attendees were outnumbered four to one by DEC and MRA officers, Ramu nickel mine staff and Provincial government employees. A request by journalists to film the presentation, so it could be shared with others unable to attend the Forum, was refused by DEC and the Scottish scientists. Why did the PNG government only instigate an independent review of marine dumping 7 years AFTER approving the Ramu nickel mine waste dumping? Why is the PNG government wasting public money on Forums for expensive foreign scientists to speak to 7 or 8 members of the public? Why was the Forum organized in a University auditorium AFTER the academic year had ended and students gone home and why were all the university staff unaware of the meeting? Why would DEC and the scientists refuse to be filmed? Surely they weren’t saying anything that was untrue?